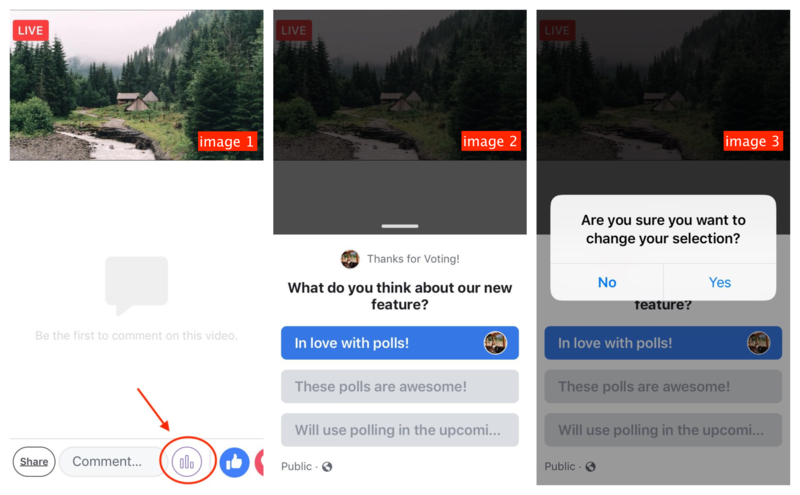 We are glad to present you Polls that are now available for all the users whether you broadcast to your timeline, page you manage, or group. 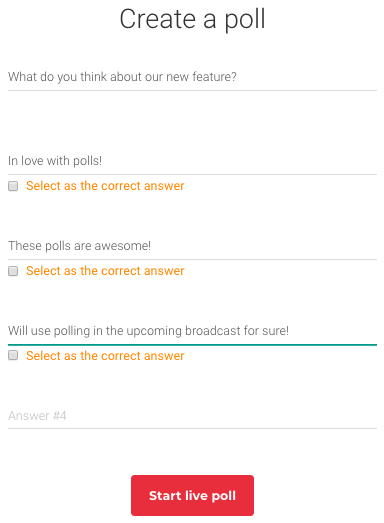 Polling invites your viewers to join the fun, and that will surely help you to spark conversation and engagement. So, let's have a closer look at how to create the poll! Make sure you've created a Talk Show broadcast. 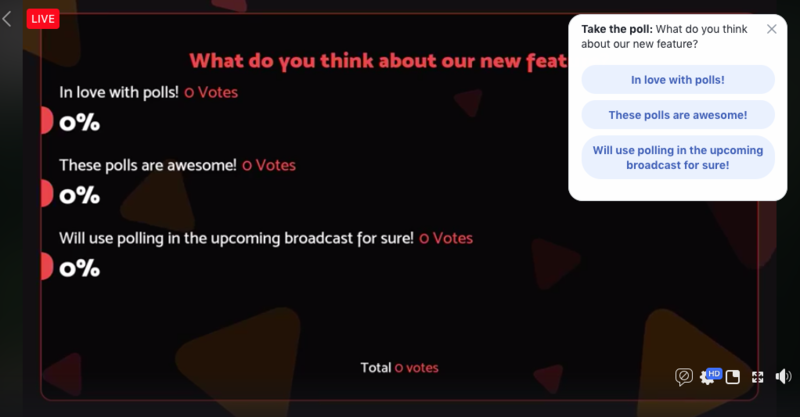 Keep also in mind, the option Add a Poll appears in the lobby section ONLY after you go live. 2. Enter your question and add possible answers by pressing Add a Poll. 3. Once done, click on Start Live Poll and move it to the broadcast section. Note, the poll will also be available for your viewers even if the box wasn't moved to the broadcast area. 4. To end the polling, drop it back to the lobby and click on End Voting button. Remember, only 1 poll can be created at once, so after you finished the first poll, you can create another one. Polls can also serve as a Quiz! We’ve added the ability to indicate a correct answer, so you can mark the right answer or have the poll without it. It's possible to add only 2-4 answers, and they cannot be the same. Answers are limited to 80 chars and Questions - to 120. Keep in mind, your viewers won't be able to vote after you ended polling. You may also be wondering how does it look like for your viewers. The Vote button can be found in the top-right corner after the video was enlarged. It's possible to choose only one answer, and the results will be shown in real time. TIP: Changed your mind? In case it's a polling without a preset correct answer, it's possible to change your choice by clicking on the answer you selected before. The blue line (image 1) identifies the regular polling and the red one (image 2) – the polling with the preset correct answer. If you're using your mobile, you can find the Vote button right next to the comment field at the bottom of the screen (image 1). Press it to get the answers and choose the desired one (image 2). TIP: Changed your mind? In case it's a polling without a preset correct answer, it's possible to change your choice by clicking on the answer you selected before (image 3).